To announce the GRAMMYs‘ return to New York, The Recording Academy worked with creative agency TBWA\Chiat\Day and director Spike Lee on a star-studded film, NY Stories. Featuring New York artists sharing New York musical stories, the film takes viewers on a musical tour of the city — from The Apollo Theater in Harlem to Jay Z’s Marcy Projects in Bedford-Stuyvesant, to all neighborhoods and musical landmarks in between. The Recording Academy and singer/songwriter Andra Day will kick off the 60th GRAMMY Awards nominations by revealing nominees in the four General Field categories (Best New Artist, Record Of The Year, Song Of The Year, and Album Of The Year) live on “CBS This Morning,” Tuesday, Nov. 28th at 8:30 a.m. ET. Immediately following, at 8:40 a.m. ET, the Recording Academy will announce nominations across all 84 categories via press release, GRAMMY.com, and the Recording Academy’s social media platforms. The Recording Academy™‘s GRAMMY Recordings and RCA Records will release the 2018 GRAMMY Nominees album on Jan. 12, 2018, in stores and via digital retailers. The latest installment of the best-selling series—now in its 24th year—features a collection of the biggest and brightest GRAMMY-nominated music for the upcoming 60th Annual GRAMMY Awards®. A portion of album proceeds benefits the year-round work of the GRAMMY Museum and MusiCares—two charitable organizations founded by the Recording Academy that focus on music education programs and critical assistance for music people in need. Beginning Nov. 24, during “GRAMMYs Greatest Stories: A 60th Anniversary Special” at 9 p.m. ET/PT on CBS, music fans can log on to 2018grammyalbum.com or cbs.com/grammys to pre-order the album and enter for a chance to win a trip for two to the 60th Annual GRAMMY Awards on Sunday, Jan. 28, 2018, at Madison Square Garden in New York City. *No purchase necessary to enter or win. 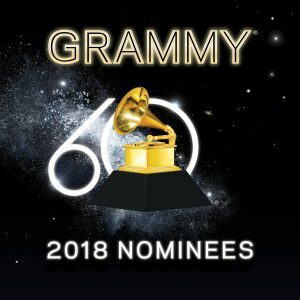 Visit 2018grammyalbum.com or cbs.com/grammys for details and eligibility requirements. The Recording Academy welcomes this year’s class of GRAMMY nominees. Already a 21-time GRAMMY winner, JAY-Z leads with eight nominations, followed by Kendrick Lamar (7), Bruno Mars (6), Childish Gambino (5), Khalid (5), No I.D. (5), and SZA (5). Selected from more than 22,000 submissions across 84 categories, the nominations showcase some of the most gifted music makers of the past awards year (Oct. 1, 2016–Sept. 30, 2017). 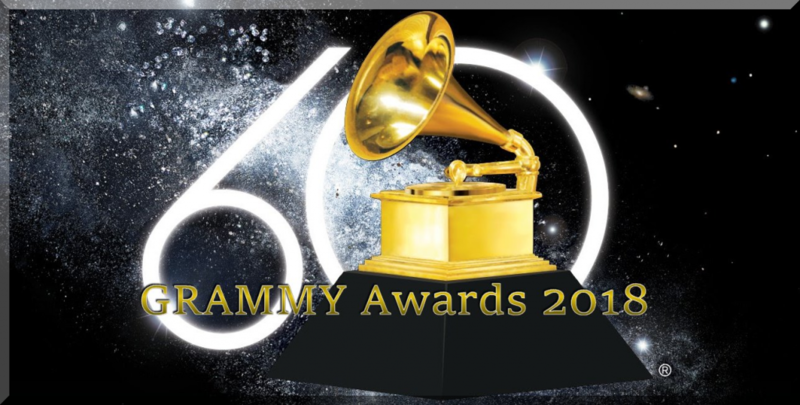 As the only peer-selected music award, the GRAMMY is voted on by the Recording Academy’s membership body of music makers, who represent all genres and creative disciplines, including recording artists, songwriters, producers, mixers, and engineers. The final round of GRAMMY voting is Dec. 7–21, 2017. The Recording Academy will present the GRAMMY Awards on Sunday, Jan. 28, 2018, live from Madison Square Garden in New York and broadcast on the CBS Television Network from 7:30–11:00 p.m. ET/4:30–8:00 p.m. PT. The following is a sampling of nominations from the GRAMMY Awards’ 30 Fields and 84 categories.